The Academic Year 2013 application guidelines for G-COE Scholarship C (Prize Fellowship for Doctoral Degree Students in G-COE Research Projects) are as follows. ■application period: between November 5 and 6. We are pleased to announce the recruitment of Senior Researcher under the “Digital Humanities Center for Japanese Arts and Cultures”, Ritsumeikan University for Academic Year 2013. Please refer to the guidelines below for more detail information. This is the scholarship to support the excellent students of the doctoral programs and the integrated doctoral programs at our university who are in school over the third year conducting a study at 3 bases of G-COE Research Project. ■application period: between June 14 and 20. 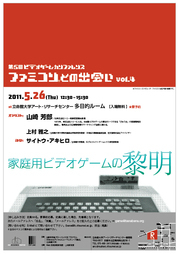 The postponed 5th Conference on Video Games: Encounter with the Famikon - vol. 4 will be held. We are now inviting additional applications for the 2012 International Training Program (ITP) for Young Researchers, a program whose purpose is to send young researchers overseas. The Ritsumeikan University provides the Global On-Site Training Program for Young Researchers on the Protection of Cultural Heritage and Art Work that is based on the International Training Program (ITP) for Young Researchers selected by the Japan Society for the Promotion of Science. This program offers the university’s PhD students, Postdoctoral fellows, assistant professors, researchers and so forth an opportunity to stay at partner organizations overseas and conduct research on topics related to the Research Center for Disaster Mitigation of Urban Cultural Heritage and the Art Research Center for a fixed period (over 2 months and under 1 year). The aim of this program is to nurture talented researchers with an enriched global view, through research activities conducted in a foreign language, building a network of researchers, and acquiring skills such as presenting research results. 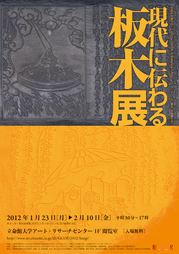 In order to share information on hangi (printing blocks) as part of the joint research by the Digital Humanities Center for Japanese Arts and Cultures under the MEXT Global COE Program (Ritsumeikan University) Japanese Culture Research Group and Professor Kazuaki Nagai from the Faculty of Letters at Nara University, we have been building a digital archive of about 5,000 hangi kept at Nara University and made the archive available for access. In addition, these hangi were exhibited at the “Kinsei Hangi” (printing blocks of the modern period) exhibition (February to March 2009), and we have continued questioning what hangi are and what we can find out from hangi. We are pleased to announce the following symposium titled “<Gaichi> Bungaku-e-no Shatei”. Please feel free to come and participate. Images of “gaichi”—foreign colonies or territories once owned by Japan—have been created in various forms of media, such as newspapers, magazines and travel guides. Meanwhile, this formation of the image of gaichi has become the foreground in relation to the “naichi”—the cultural and political center—and within the reciprocating of the center and peripheral images lies the strength of Japan’s colonial system. This symposium will summarize the past 5 years of the Ritsumeikan University Global COE activities and examine the possibilities of gaichi literature research. Besides the presently scheduled publication of “Gaichi Bungaku-e-no Shatei”, a collection of theses centering on Kazunobu Kimura who is responsible for research activities, this symposium will also discuss the scope of methodology within gaichi literature research. The aim of this symposium is to access the materials collected and processed into a database at the Ritsumeikan University’s Art Research Center to consider the images of Japan and Korea in Korea under Japanese rule. While the Kyeongseong Ilbo newspaper is believed to have been mainly read by Japanese people living in Korea during Japanese rule, from the articles we can get a glimpse of the dilemma concerning what sort of intermediate stance these Japanese were supposed to take. 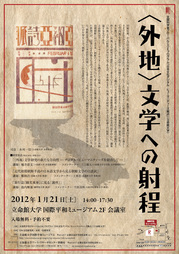 The symposium will also examine problems regarding Japanese translations of modern Korean literature. By finding out what kind of dynamics were at work in terms of the translation of texts, we may be able to see the arbitrariness of the image of Korea. 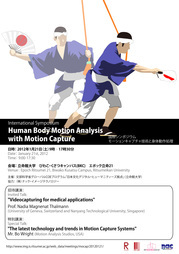 We are pleased to announce that an international symposium titled “Human Body Motion Analysis with Motion Capture” will be held. Cosponsored by: nac Image Technology Inc.